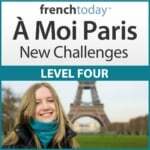 Home > French Blog > How To Learn French > How to Make French People Speak French to Me? I often hear the same complaint: “As soon as I start to speak French, French people switch to English”. This is indeed a problem for students of French who went to France to practice their French. In this article, we’ll see what can be done about it. 1 – Why do French People Switch to English? When speaking to a foreigner, French people often switch to the other language if they can. Why? Is it to show they can speak another language? Maybe. Do they think they are being polite and making you more at ease? Probably. Do they want to practice? Absolutely. One thing is certain though, the idea that YOU may want to practice your French doesn’t really cross their mind! They don’t realize that this can seem rude and so frustrating to someone that spends months/years trying to learn and master French. The fact that a French person speaks English to you doesn’t mean s/he cannot understand your French. As we saw above, s/he just has her/his own agenda. So don’t be too sensitive about it, and just persevere: keep speaking French, it’s your right, and you worked hard for it! The French person should get the idea and switch back to French. If not, then s/he’ll speak English, you’ll speak French, and at least you’ll get to practice your French! When traveling to a French-speaking country, you are entitled to practice your French. But you also need to be aware of the context. All French people are not your private French teachers. So, if you are somewhat fluent in the language, this should not be a problem, and you shouldn’t hesitate to state your preference to speak French. But you have to be able to at least communicate for people to engage in an exchange in French. So try to be sensitive to the context and the people you are engaging in a French conversation. Then, when the time and place are right, be firm about speaking French. I already talked about this in my article “Vacationing in France to practice your French“. Paris is a busy city, a lot of people do speak English and won’t have time for you. You will have more luck in smaller French cities or the French countryside where people don’t speak English and will be happy to meet a foreigner who is learning French, and glad to help you out. “Je ne comprends pas tout” – I don’t understand everything – better than “je ne comprends pas” which means you don’t understand ANYthing. You’ll find exclusive mini-lessons, tips, pictures and more every day on French Today’s Facebook, Twitter, and Pinterest pages – so join me there!